MintLife Blog > Credit Info > Mint by the Numbers: Which User Are You? Data and analytics can tell us a lot about people – what can it tell us about you? Find out how you can tell your story in a future post! Did you know Mint has been around for ten years? Over this decade, we’ve grown to include over 20 million users! With the vantage of time and numbers, we are now able to identify trends in the ways you use Mint. Our analytics wizards looked at different characteristics and behaviors, and we found the data fascinating. It tells us so much about how people using Mint spend and save, and how Mint can be useful to people with wildly different financial lifestyles. Over the next few months we will be sharing this information with you, and we want to tell your stories. Can you see yourself in the numbers? Each month we will look at a different topic and show you what Minters are like, gleaning the info from the data. The first thing we looked at was credit card usage. Looking at so many Mint users, a clear division in credit card payment behavior emerged. The trend is clear: 35% of active Minters carry credit card balances from month to month, while the remaining 65% pay their previous month’s balance in full, or even their entire balance every time they pay. Does this sound familiar? These numbers line up with national ones – as of 2014, about 34% of American households carried at least some credit card debt. In general, people who pay their balances off regularly tend to pay less for their credit cards, which they use for regular spending. They check into Mint more often, which could help them to keep track of their spending and stay on top of due dates. Some more trends we can see have to do with lifestyle and background. More women and married couples carry balances versus those who pay their balances off, and the data shows people who reported living with children are more likely to carry high balances. People who pay their balance tend to be more educated and have higher incomes. Plus, they tend to save more and invest more than people who carry balances month to month. Data shows the best savers tend to be previous month balance payers, followed by full balance payers. Conversely, people who carry balances are more likely to have personal loans (not mortgages), but those who use over 50% of their credit card limit are less likely to do that, which suggests that they cannot qualify for or haven’t considered a personal loans to consolidate debt. We ran an informal poll on Twitter to see what people are saying online. @mint yep charge everything to my #amex card to get points, pay it all off at the end of each month! Follow the hashtag #realtalkseries and @mint on Twitter to participate in our next poll! Which Mint User Are You? 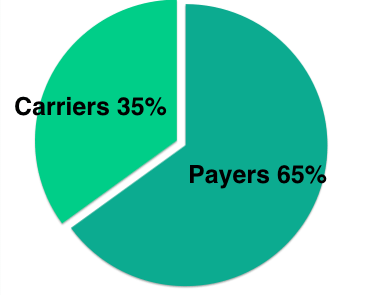 Do you consider yourself a balance payer or a balance carrier? Do your other spending/saving habits line up with what you see here? We want to talk to you! We would love to find out if Mint helped you get ahead of your credit card debt, or if you’ve always been a balance payer, or if you are struggling to pay down your debt and could use a helping hand from Mint to get it done. In future months, we’ll be focusing on housing (owning or renting), how to live on less, traveling the world, and student loans. If any of these topics fit your financial goals or dreams, please let us know and we might feature your story! Contact us at Editor_Mint@intuit.com with “Mint User Story” in the subject. We can’t wait to hear from you! Kim Tracy Prince is a Los Angeles-based writer whose Mint story goes back to 2012. She works hard to stay in the “balance payer” category.